As much as we all might wish for it, there is no panacea in veterinary medicine, no cure-all for the myriad of conditions veterinarians and therapists are treating daily. There is one device however that is more versatile than almost any of the other tools in the veterinary toolbox: a laser therapy system. Laser therapy was primarily used for treating equine conditions when it first hit the market back in the 1980s, and was mostly used by therapists. Even though studies have been conducted on the mechanisms and efficacy of laser therapy dating back prior to the 1970s, it has been a very slow process of adoption for a multitude of reasons. A few of the most important reasons are, 1) the inability to feel or see the treatment working, 2) optimal results occur over a series of treatments ; not from a single dose, and 3) the introduction of laser therapy occurred when pharmaceuticals were also experiencing a growth surge due in part to the emergence of the biotech industry and the entry of generic drugs to the market. Laser therapy persisted throughout this time period; therapists continued using their lasers to decrease pain and inflammation, and to accelerate the healing of soft tissue. By the mid-1990’s, laser therapy starting gaining the attention of veterinarians as advances in veterinary health care and nutrition were extending the lives of companion animals , just as it was doing for their owners. Pets living longer were experiencing similar aches and pains from aging that people do; arthritis, degenerative conditions, injuries due to weakened muscles. Veterinarians looked for means to increase quality of life for these animals as they moved into their golden years, and laser therapy provided a welcome solution. During the early 2000’s, laser therapy systems burst onto the scene in small animal veterinary practices. What started with rehabilitation specialists adding laser therapy to their services, evolved into vet laser therapy being used in all aspects of veterinary practice. Laser light at specific wavelengths is well documented for reducing pain and inflammation and for accelerating the healing process. Treating soft tissue injuries like tendon and ligament tears, arthritis, degenerative joint disease and hip dysplasia are also common uses for the busy laser. Now, many additional case studies and research projects are released detailing the effectiveness of laser therapy for common but difficult to treat problems such as wounds, lick granulomas and ulcers. 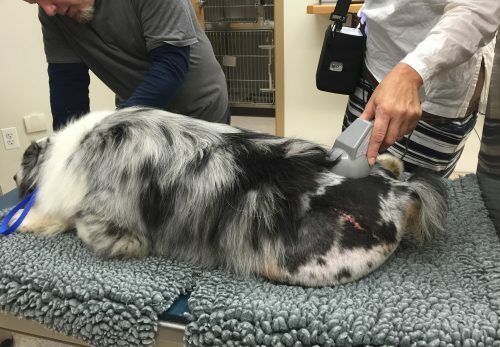 Skin conditions like dermatitis and allergies represent another growing area showing positive benefits of laser, keeping interest in laser therapy high among the veterinary community. Now laser therapy is a go-to for post-surgical treatments, and follow up for long lasting relief. The faster an animal can return to normal function post-surgery, the likelihood of success of the surgery increases, and post-surgical complications decrease. In many cases, animals that might not be candidates for surgery or for the use of anti-inflammatory or steroidal pharmaceuticals can be treated successfully with laser therapy. Promising research continues to be conducted as it relates to laser therapy and its multitude of potential uses in the future, including the treatment of chronic renal disease, combating bacterial and fungal infections, boosting cellular protection from poisons such as snake venom and more. The future is bright for laser therapy! Although it is not a panacea that will cure all ills, it gets pretty close! By treating an incredible array of conditions, laser therapy will continue to grow in application and deliver positive benefits for the clients of vets and therapists in clinics all over the world.